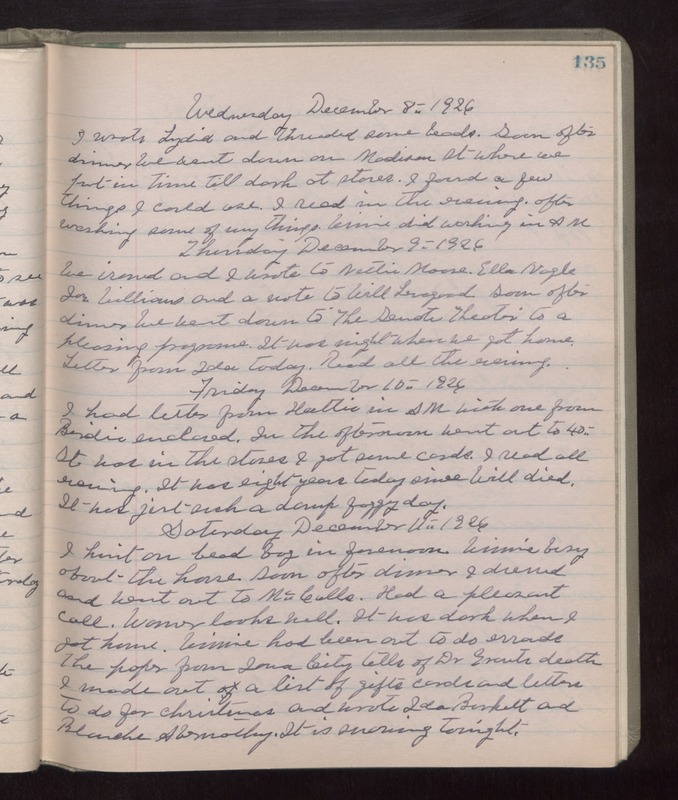 Wednesday December 8th 1926 I wrote Lydia and threaded some beads. Soon after dinner we went down on Madison St where we put in time till dark at stores. I found a few things I could use. I read in the evening after washing some of my things. Winnie did washing in AM. Thursday December 9th 1926 We ironed and I wrote to Nettie Moore, Ella Nagle, Joe Williams and a note to Will Levagood. Soon after dinner we went down to The Senate Theater to a pleasing programe. It was night when we got home. Letter from Ida today. Read all the evening. Friday December 10th 1926 I had letter from Hattie in AM with one from Birdie enclosed. In the afternoon went out to 40th St was in the stores. I got some cards. I read all evening. It was eight years today since Will died. It was just such a damp foggy day. Saturday December 11th 1926 I knit on bead bag in forenoon. Winnie busy about the house. Soon after dinner I dressed and went out to McCalls. Had a pleasant call. Warner looks well. It was dark when I got home. Winnie had been out to do errands. The paper from Iowa City tells of Dr Grants death. I made out a list of gifts cards and letters to do for Christmas and wrote Ida Burkett and Blanche Abernathy. It is snowing tonight.